Grab your baseball glove and gear up for a ballgame as the Potomac Nationals return for their 2016 season. Cheer on our Washington Nationals affiliate team located in Prince William and avoid the hassle of going into Washington, D.C. Head to the Pfitzner Stadium in Woodbridge, VA, home of the Potomac Nationals, for an affordable, fun-filled game and promotions that run throughout the whole season. Save on tickets, food, and perhaps, be the lucky winner of a giveaway! Enjoy a baseball game for only $1. Get general admission tickets for a dollar, then grab a hot dog for only one dollar. Purchase your $1 tickets online up until 30 minutes before the gates open at Pfitzner Stadium! You read it right, tickets for only $2 on Tuesdays! A ticket at $17 gets you admission and all you can eat during the game. They don’t call it the “Belly Buster” for nothing. Discounted drink specials are offered throughout the game. Fridays mean giveaways at the Pfitzner Stadium! Try your luck for a chance to win team paraphernalia. Fireworks fill the sky after every Saturday home game. 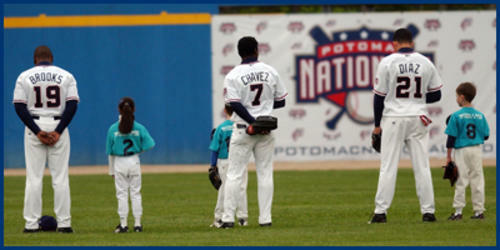 Bring the little leaguers out for a run around the bases following the end of the game on Fridays-Sundays! Looking for something to do before or after the game? Head to Potomac Mills for discount shopping and great restaurants to choose from. Try a flaming hot burger at Bobby Flay’s restaurant, Bobby’s Burger Palace, or escape to a tropical destination for dinner at Bahama Breeze (don’t forget the newly opened Matchbox). Create a fun-filled family night out with dinner and the ball game, or a sizzling summer date night with a post-game drink and dinner at one of our local breweries and upscale restaurants. Discover other events in the area by looking at our event calendar.